I’ve recently been given a 1960’s vintage “Brown Ultra-lite 1000” plate burner/exposure unit. The thing weighs about 300 pounds so I don’t think the “lite” refers to weight! Does anyone have one of these or know anything about them? The picture shows it partially disassembled — the door has been removed. On the bottom is the vacuum frame and on top is the light. I can turn it on and the blower works but when I click on the vacuum it pops a circuit breaker on the front panel. I have no manual or instructions. Any help appreciated! 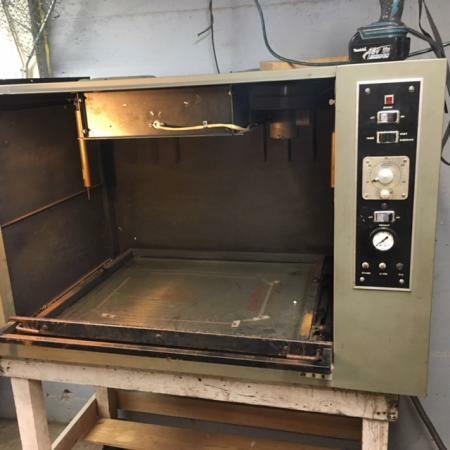 That’s not a plate burner, that’s a 1923 Westinghouse model 6000-X microwave oven!